Well, it was the week of mid term break and Halloween. I'm not the world's biggest fan of Halloween so the time off school just meant procrastination for me, but that doesn't mean I had a boring week! I just left all my work until the last minute (as per usual) . . .
. . . I made a sweet pizza! I love making ordinary pizza from scratch but I fancied switching it up this week, so I made a sweet base, chocolate sauce and topped it off with gummy sweets and biscuit crumble! Very tasty indeed, but also very filling!
. . . I got two parcels in the post. One was the unbranded makeup brushes I ordered from Amazon (which I'll review soon!) 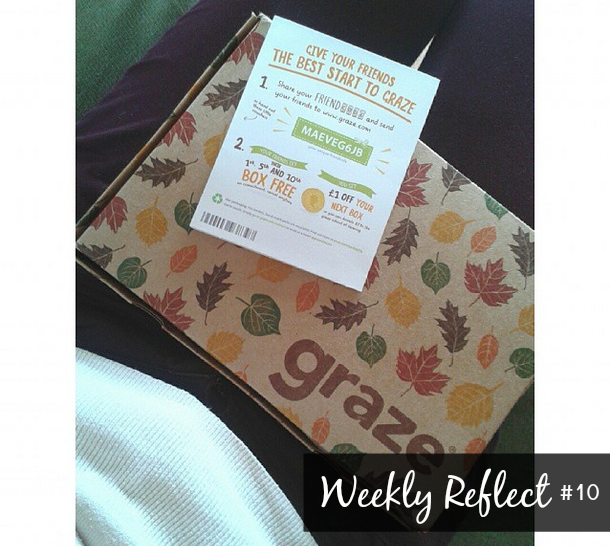 and the other was a Graze box. My favourite thing from the box was the apple & cinnamon flapjack - my mum and I couldn't get enough! If you'd like a free 1st, 3rd and 5th box, just use my code MAEVEG6JB. You're welcome!
. . . I haven't been able to stop thinking about wanting to cut my hair. I'm just so bored of my long hair so I think I'll be going for the chop soon. Look out for a Pinterest/Hair-spiration post coming this week!
. . . I wore OPI I Have A Herring Problem on my nails and have absolutely adored it! A dark shade is quite the change up for me as I usually say the brighter the better but it's grown on me. Swatches were included in my review of the Coloristiq service this week!